Specially designed for Tile Mate Previous Gen (2016 Release) / Tile Mate with Replaceable Battery (2018 Release) / Tile Pro with Replaceable Battery / Tile Style / Tile Sport. Premium vegan leather exterior with delicate stitching and soft microfiber interior protect your delicate Tile from dust and scratch when clanging with keys, adding minimum weight and feel comfortable. 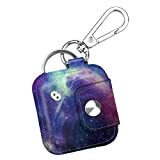 Secure snap button closure keeps the case stay closed and avoid Tile sliding out accidently; High quality metal keychain carabiner let you clip it to various items conveniently. Precise speaker cut-out won't diminish the Tile volume even in the pocket; Easy to locate button position and allows for effortless button press. Available in various colors. Fintie gives your Tile tracker classic look. 10-Pack Adhesive for Tile Tracker, Super Stickiness, Non-stick Residue Design. Combo Pack. By Logity.